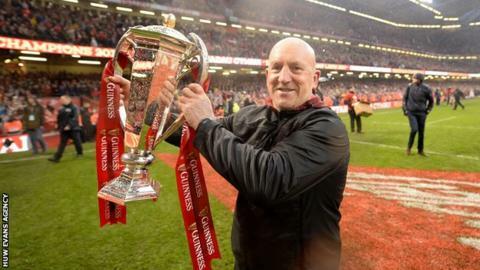 Wales should do everything they can to keep defence coach Shaun Edwards after the World Cup, according to former backs coach Mark Jones. Edwards is in talks with the Welsh Rugby Union to continue in his role in Wayne Pivac's backroom staff. Wales are lining up Edwards to work alongside Byron Hayward. "If Wales can keep Edwards in the system and it is financially viable, they need to do everything possible to keep him," said Jones. Pivac takes over from fellow New Zealander Warren Gatland after the 2019 World Cup in Japan. Edwards would work alongside Hayward who the Scarlets announced on Saturday was leaving the region alongside Pivac and Stephen Jones, who has already been confirmed in the new-look Wales coaching staff. Jones played under Edwards in 2008 and coached in the same Wales backroom team that won the Six Nations title in 2013 under Rob Howley. "It is a no-brainer," Jones told BBC Scrum V.
"Shaun is the incumbent, the guy who is setting the level at the moment. "He is one of the best coaches I have ever worked for and with." Jones also coached with Pivac and Hayward for Scarlets in the 2014-15 season before he was replaced by Stephen Jones. The former Wales wing is interested to see how the Hayward and Edwards dynamic would work. "With Byron potentially coming in I am certain he would like to put his own slant on the defensive part of the game," said Jones. "He has worked with Wayne before. It will be interesting to see how Wayne would manage that scenario if it panned out."